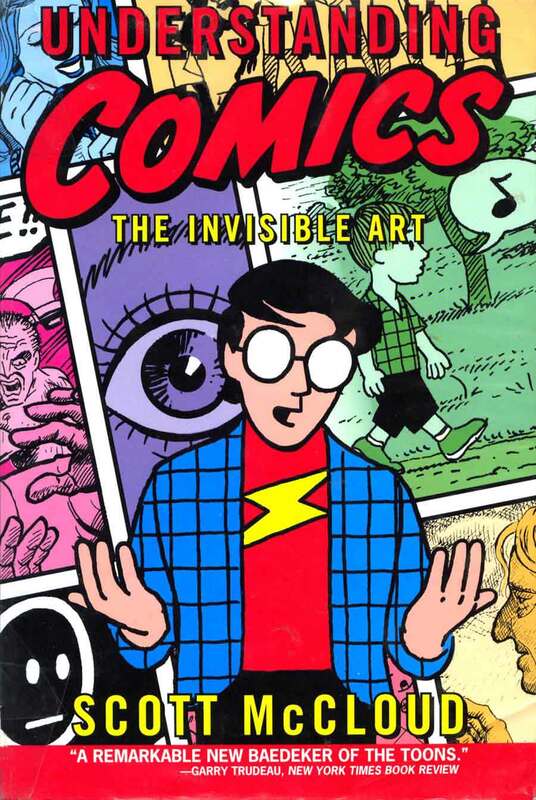 Understanding Comics – The Invisible Art is quintessential reading for those who appreciate comic books as a legitimate art form. It explores, with great authority, the method underlying the form of combining words and pictures in sequential art storytelling. 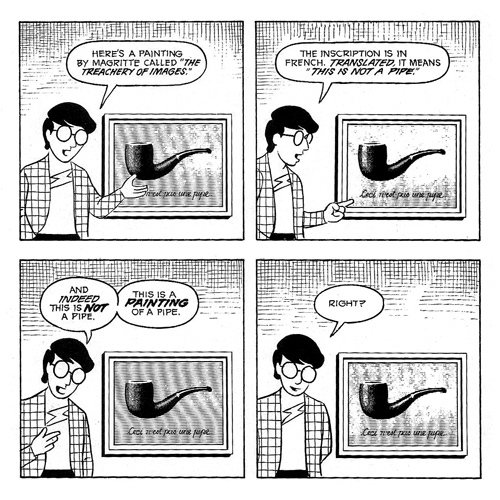 So what does all that mean to folks who don’t fall under the Art Nerd category? 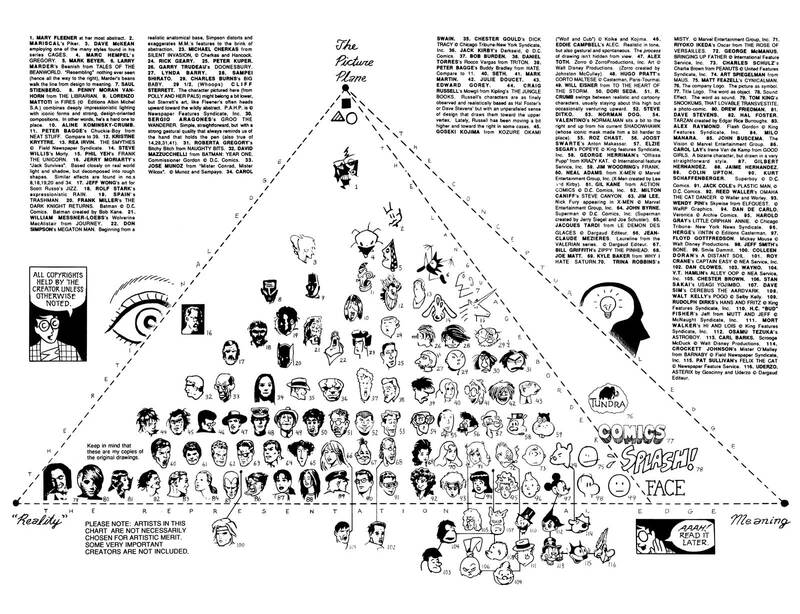 Scott McCloud, who is creator of the both the book’s works and graphics, actually illustrates his theory and methodology as you’re reading about it–which is great for visual learners, and definitely drives home the points he is trying to make. What is more, the research is intensely thorough. Check out the chart on page 52-53 where he maps out the geography of the comic art universe, in which comics are located based on their varying gravity towards Reality, Meaning, and the Picture Plane. Drawn images, McCloud points out, are all symbols, including the visual depictions of our languages. Yet written language is received, and is the process of training and education… whereas a drawing of a woman or a boat is perceived–that is, instantaneously understood as a representation of that thing. Comic arts, among other things, is a practice of reconciliation between these two distance cousins–an attempt to harmonize them in a way that only uses one sense–sight–to take it in, and yet professes all of our senses, and all perceived dimensions–including time. So what does the typical comic reader get from reading Understanding Comics? You may wish to pick it up as a map of what kinds of styles are out there, in terms of culture, style, time period. Or you may find it empowering to more deeply understand the comics you already know and love. Whatever the case may be, the book is a must-read for comics aficionados… and, arguably, those looking to understand why comics are once again on the rise. For those who read and like Understanding Comics – you will probably want to check out McCloud’s next installment – Reinventing Comics, which takes the theory and method to the next level, and explores some of the new realms comics are tackling. Scott McCloud also has a wonderful Ted Talk that combines the fundamentals of both of these books. 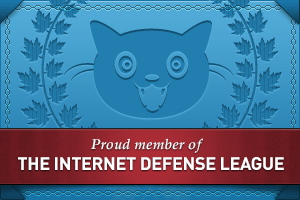 Click on the image below to check it out in a new window. His books are truly great for learning the medium of Sequential Art.